If you drive often in the winter, having a second set of tires to help you maintain control in snow and ice could help you drive with a higher level of confidence. Winter tires are made of a softer rubber compound that increases the grip on the road. Their tread pattern is also deeper and has more biting edges. When you need to have your tires swapped in the fall and spring, our dealership in Grand Rapids is ready to take the stress out of the process. 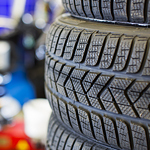 We can offer sound advice about which set of tires would be best for your vehicle.